A symmetrical design for more ergonomic setups. According to OffSet, the conventional double pedal design, with a secondary pedal extending off to the side of the primary pedal, fails to account for comfort and ergonomics. 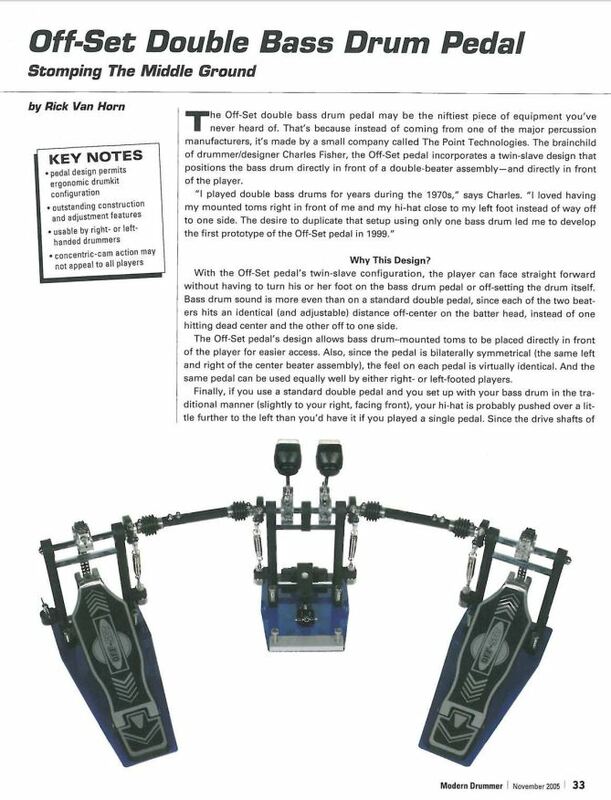 In response to that concern, OffSet has designed a bilateral double pedal that aims to put the drummer’s body in a safer and more efficient position. Drummers who struggle to find a comfortable configuration for their kits will understand the issue that OffSet is tackling here. Adding a double pedal to a drumset can really throw things off—oftentimes you’re forced to alter your hi-hat, bass drum, and tom placement, potentially resulting in a setup that’s in a constant state of flux. 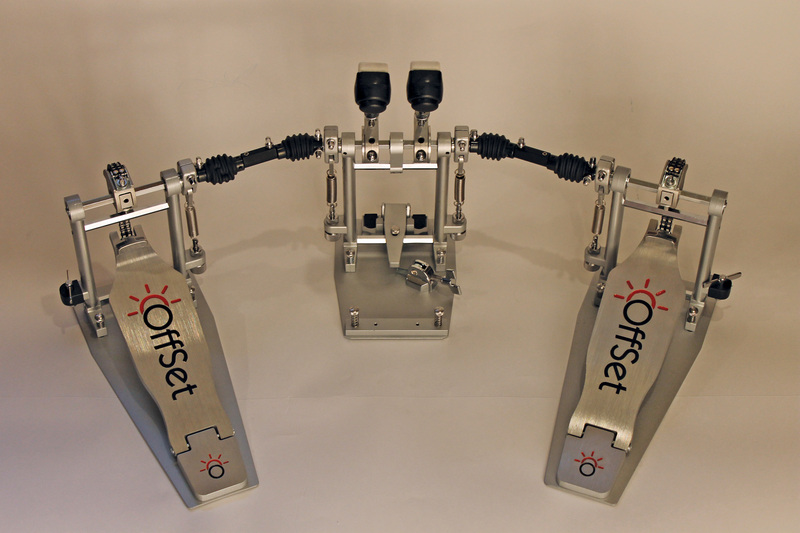 OffSet’s bilateral pedal features a fully adjustable design that allows you to fit the pedals into your current configuration with minimal alteration. For review, we received a chain-drive Eclipse model double pedal, plus a direct-drive conversion kit. Let’s take a closer look. The Eclipse features the same top-quality specs that you’d expect from a high-end pedal. All moving parts have sealed bearings, and it’s strong but lightweight. Despite having more moving parts than a standard double pedal, the Eclipse is fast and easy to set up due to its thoughtful design. I especially liked that the hoop clamp adjuster was easy to reach, since the footboard doesn’t block it. The bottom of both footboards and the pedestal are fitted with hook-and-loop fasteners and adjustable spikes, so they lock into place easily. During my time with the Eclipse pedal, the footboards stayed put on any rough surface or carpet. Converting the chain drive to direct drive was quick and easy, and it was nice to be able to adjust the feel of the pedals for different applications. The value of the Eclipse pedal is in its customization. Every component is adjustable. The footboards are 12.5×3.5, which is the largest in the industry, and they respond accurately to either heel-up or heel-down playing. 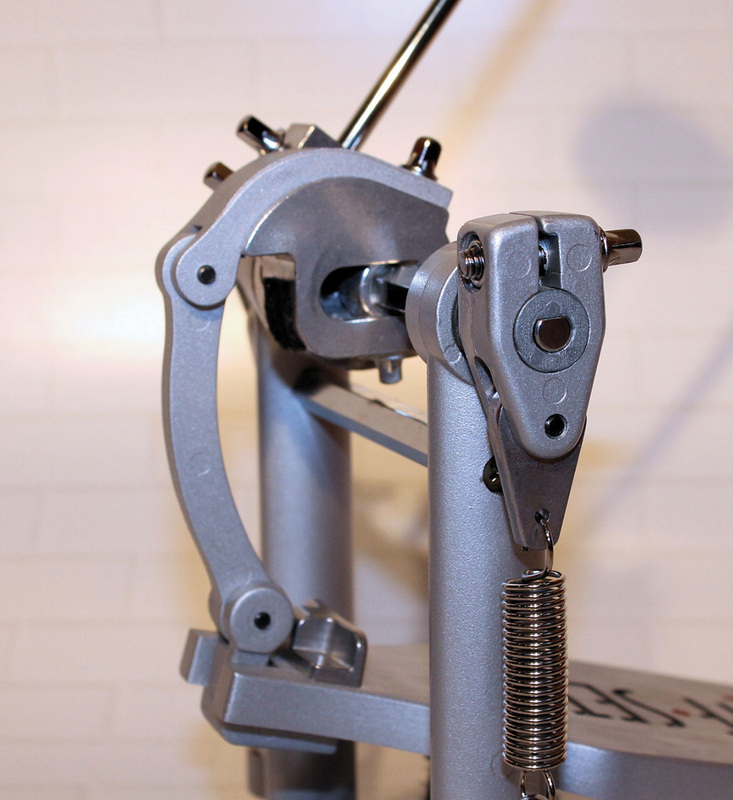 The drive wheel can be adjusted via a drum key (there are key holders on the outside pedestal of both pedals) from 1.5″ for speed playing to 3″ for power playing. I tried all of the positions for the drive wheel and felt most comfortable with it at the midpoint, which left the beater at a moderate distance from the drumhead. If you’re a speed metal player, you’ll find the Eclipse comparable with other pedals marketed towards that genre. With the drive wheels set to the 1.5″ position, the pedals were extra responsive and snappy, which allowed for quicker playing. The long footboards also allowed me to move my foot lower on them when playing at fast tempos, and they were great for facilitating heel/toe techniques. This pedal is most useful for players who want to achieve a more ergonomic, symmetrical setup. If you prefer to mount your rack toms directly on the bass drum, the Eclipse will allow you to move the bass drum over so that the toms can be centered over the snare. After experimenting with the Eclipse pedal for a couple weeks, I noticed a slight improvement in my posture and ease of playing. 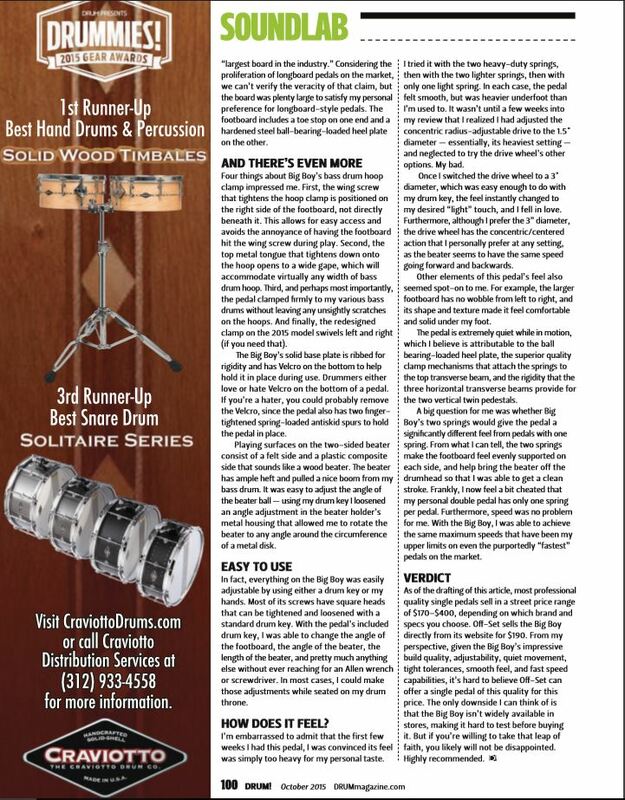 It wasn’t a huge difference for me, but other drummers may experience a more dramatic effect. I found the OffSet Eclipse double pedal to be a refreshing example of drum-gear innovation. The company offers a thirty-day trial period for its products, so if you’re looking to try something different, head over to offsetpedal.com to find a dealer near you. List price for the Eclipse pedal is $389, the direct-drive conversion kit is $69.95, and a padded case is $99.95. 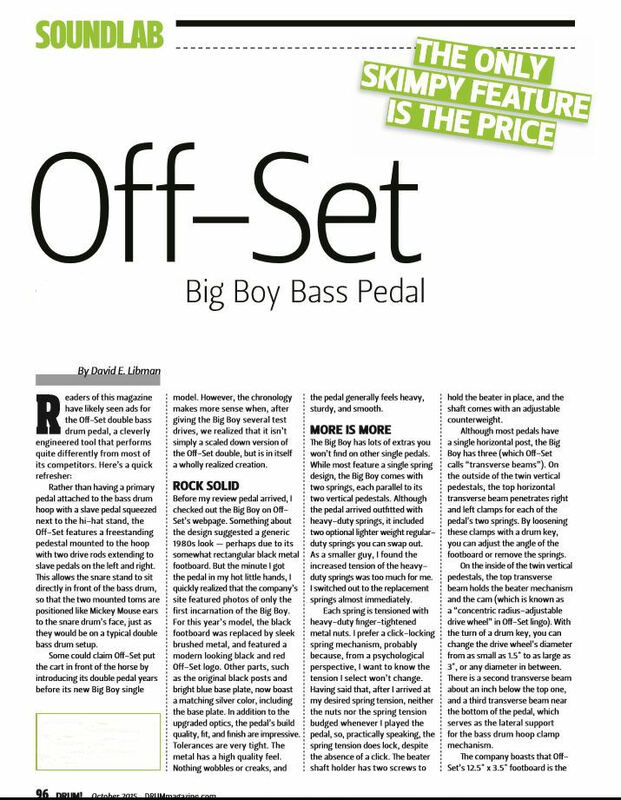 Off-Set Double Bass Pedal Reviewed! From the wilds of Pennsylvania, U.S.A., comes Charles Fisher with his maverick new invention, the Off-Set double-bass pedal. Unlike your standard double-pedal footwear, the Off-Set does not have a main and a secondary footboard. Instead, the Off-Set’s pedals are placed to the left and the right of the bass drum, thus allowing you to ergonomically configure your kit by planting your throne directly behind the kick. Granted, it looks a lot different from what you are used to playing, but I’ll give you the skinny right here at the start: It’s a pretty cool piece of gear made with some serious quality. I unboxed and set up the Off-Set with gleeful assistance from the owner of my local drum-rental company. First, take our advice, and follow the included instructions. We didn’t, so set up became a little bit of a pain. The pedal might have worked straight out of the box, but we started tweaking it right away and got sort of … confused. Just contain yourself, and spend the few extra minutes getting it right. After attaching the Off-Set’s center frame to the bass drum hoop, we discovered that neither the left nor the right beater can be placed dead center on the drumhead. A support piece on the center frame precludes either beater from sliding into the fully centered position. On the plus side, this still allow for both beaters to hit symmetrical spots on the head — very barely off-center — and produce symmetrical tones. 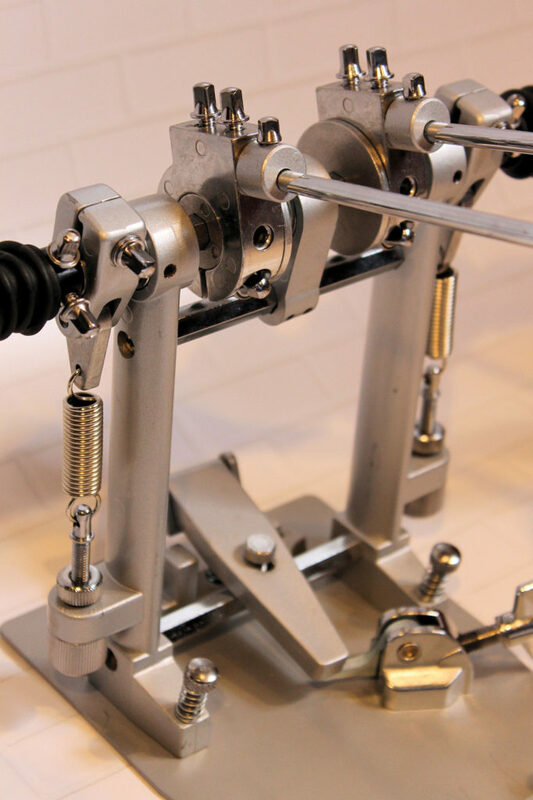 The pedal itself is fully adjustable for tension, throw, pedal height, and beater height. The very nice double-faced beaters (felt and plastic) come complete with adjustable counterweights. The pedal also boasts a double-chain drive on a round cam, and there is Velcro on the bottom of all three base plates. (I must confess that I loathe Velcro on base plates. Is it just a fashion trend? Am I alone in this?) One of the advantages of the Off-Set system is that it reduces the amount of “push-pressure” on the bass drum. Your leg doesn’t push the drum all around the floor, so as long as the pedal’s base plate is secure, the bass drum nicely stays put. Once up and thumpin’, the Off-Set got really rave reviews from both me and Mr. Drum Rental. Between us, we’ve played quite a few pedals, and this is a good one. We think that the Off-Set’s overall quality workmanship contributes to the fine feel of the pedal because there is absolutely no mushiness in the action. Both drive shafts are beefy, well-made, stiff, and even covered at the joints with rubber booties, like an automotive axle. Points for that. The pedals stayed put, Velcro and all, and they felt like two single pedals — very responsive and really tight (in the good way). 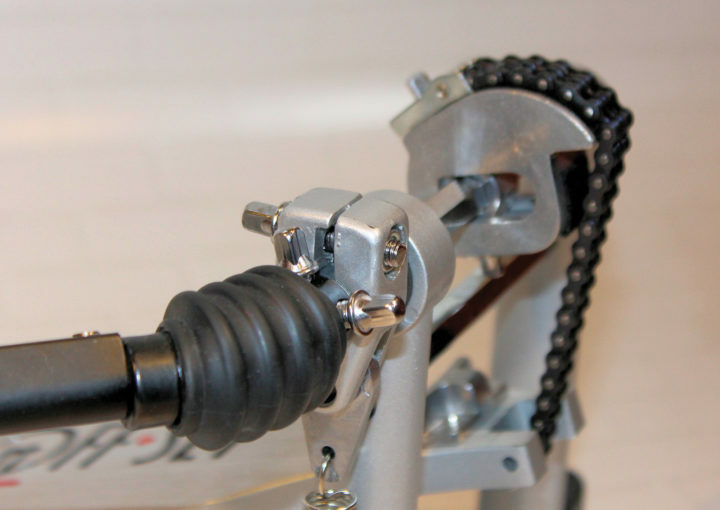 Furthermore, the Off-Set has springs at the center frame and at each pedal. This thing is faster than you (yes, even you, Mr. Fleet-of-Feet) and not likely to fall apart on a gig. My friend did opine, however, that setting up the pedal for the first time (as in new-and-out-of-the- box) on a gig could be a nightmare because it takes some adjusting to get it where you want it. 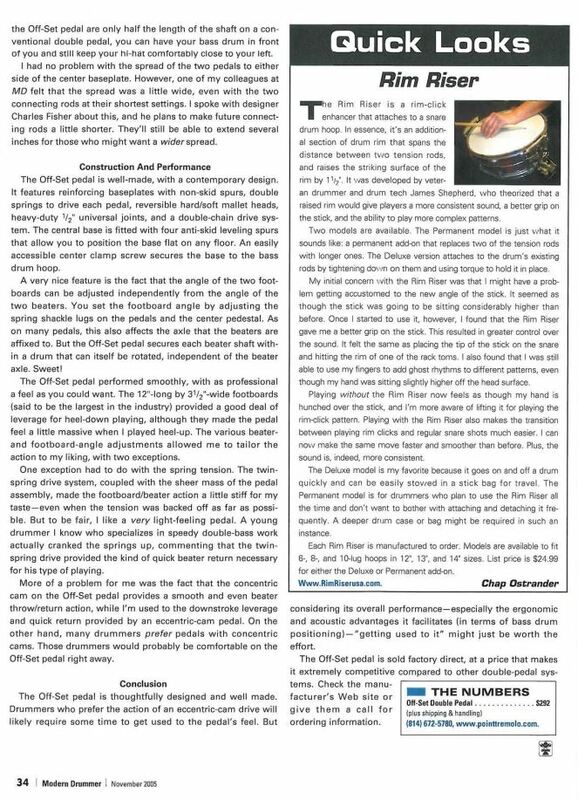 Please do set the pedal up with a drum buddy around because the Off-Set — besides being fun to play — is a catalyst for long, lively arguments about drum history and ergonomics: Do you think the old jazz guys set up low and close because they liked it? Or was it because they had no other choice? If the remote hi-hat had been invented first, would we all be playing cross-handed? Didn’t the invention of the boom cymbal stand allow you to put the cymbals closer to your center? Why do we continue to put toms on the bass drum when the bass drum is not the true center of our kit? How else can a drum set be more ergonomic? Will I be able to play better? These are just suggested topics for throwing the gauntlet. Don’t forget the Band-Aids. I have been playing on my new Offset-double pedal for over a month now and couldn't be happier with my choice. Delivered to my door under $400!! I was first taken with the heft of the components as I unpacked the box. There is almost no plastic on this thing. All the posts are solid steel with double horizontial supports. I had to follow the instructions really freakin' carefully while assembling the first pedal but then it all made sense and I flew through the second one. From box to kick was under 15 minutes. I started off by trying to match the right foot's feel to my old Yamaha pedal (that I had just retired after 28 years of solid service). That took the better part of about an hour and then I did some more fine tuning for about a week after. Haven't touched it since. As I fiddled with these pedals, I absolutely marveled at the level of adjustability. With four springs to play with, seperate beater angles, pedal heights, cam position (turned out to be the most dramatic change in response and the magic "Ah-ha" for my right foot! ), distance from the beaters to the pedal, and sliding beater weights, I cannot imagine anyone not being able to find a way to adjust this pedal to their liking. The beaters have a plastic and felt side for different attacks, too. The other factor that pushed me to the Off-set was the ergonomic changes it brought to my kit. As you can see in the pics, this thing puts you, your kick, and your snare in a nice straight line with hats and ride snuggled right up close and floor toms more accesible due to less twisting required to reach them. I have never felt this comfortable. If you go to the Off-set site, there is a great diagram that illustrates this even better. There are also single pedal versions of the pedal for either foot which has potential for changing the ergonomics of a single pedal kit or adding aux percussion, too. The only way I could see this aspect as a down-side is if you put your toms on a stand next to your kick. You would need to either mount them on seperate stands on either side of the kick or get a rack to go over the kick. My double pedal came with a HH stand as part of a promotional giveaway. I want to mention that this thing is a beast as well. It is the heaviest, most solid standing HH stand I have ever owned, which is saying something because, unlike my choice in kick pedals, I never could find a HH stand that I really liked, and could readily afford!! I think I have been through 6 or 7 of them before this one. It has a great tension adjustment that can make really fine changes to your HH response. The legs rotate to accomodate a double pedal quite nicely. If Mr Fisher is still offering them on the Offset site, I fully endorse them as well. They usually go for about $170, I think. Speaking of Mr Fisher, he is the inventor and owner of the company and the man who answered the phone when I called with my insipid questions. He was patient and kind to me and went out of his way to make sure that I was well informed about this product since I could not try one before pulling the trigger. The product is fully guaranteed, but I will not be returning mine. This may be the last double pedal and HH stand that I buy ever. Unless I get another kit...I hope this was helpful to someone out there. I hate to type!